As a social media agency, we’ve tried a gazillion tools to make our work better for our team and our clients. After a ton of trials and weeding through ones that didn’t fit the bill, we now have a handful of amazing tools that we use all the time. So I thought, why don’t I share these tools with you? 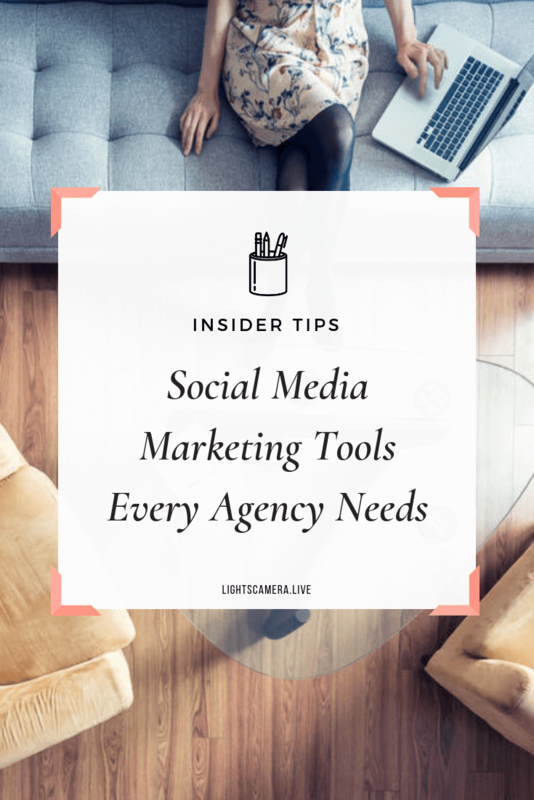 Not only will it save you oodles of time in finding good tools, but I can share a little love to the apps that make our agency life oh so sweet. This list came from a great chat I had on an Agorapulse livestream last month. If you want to see that “tool talk,” here it is for your viewing pleasure. Now, on to the list of our go-to social media agency tools! I have to start with a livestreaming tool, right? So let me tell you: if you want to stand out in the world of livestreaming, try Ecamm Live. This tool boosts your branding by allowing you to include intro and outro videos. You can also make your broadcasts much more interactive by sharing your screen or displaying viewer comments. If you like to build momentum for an upcoming broadcast, Ecamm Live lets you schedule your livestreams in advance. Grab the scheduled link Ecamm Live gives you and post it everywhere! You might be saying to yourself, “Don’t other tools do this?” And you’d be right. But unlike other products on the market that only focus Facebook Live, Ecamm Live puts the power of Facebook Live, YouTube Live, Periscope, and Twitch video streaming at your fingertips. Plus it’s a one-time purchase - no monthly fee! Download the app to your Mac and start using it right away. And be free from those pesky recurring invoices! Another great advantage of Ecamm is their development team. They’ve set up a Facebook group to gather input and ideas from their users. I’m delighted to see all the new features they've rolled out this year -- many of which came from the Facebook group. Price: $79. Again, it’s a one-time fee. There’s also a free trial. As a social media agency, we strive to keep our clients’ data and logins 120 percent safe. That’s why we use LastPass. It's a simple way for me to log into any of my clients’ accounts and websites to get the information I need. In terms of collaboration features, it’s easy to share access with teammates. But if a member on the team leaves us, I can just as easily disable their access. I’ve talked before about how video can drive engagement, encourage comments, and retarget your audience. So if you could use a video template to make your videos stand out, would you do it -- especially if the template was a measly $10? Well, we do for sure! And VideoHive is our go-to place for these awesome templates. For one of my clients, we create content every year at San Diego Comic-Con and it can get really crowded. That’s why I use my smartphone as part of my mobile rig. To pull in viewers and edit the video for maximum impact and shareability, we take the footage and hand it off to a video editor along with a comic-themed video template. I use InShot for more DIY-style videos for clients. It allows me to create photos, photo collages, and edit videos from one app on my phone. If I go to Balboa Park, a top attraction here in San Diego, and I want to record the vibe around me, I'll film it on my smartphone. I'll grab five seconds of video of the entertainment, five seconds of the food trucks, and five seconds of the crowd. Then I’ll take all of those snippets and edit them into one video using InShot.The app lets me include transitions, add music, change the canvas size -- whatever I need to make the video right. Here’s an example of how I used InShot to film a family outing at the Japanese Friendship Garden in Balboa Park. Like VideoHive, Creative Market is a library to better brand your visual content. I’m in love the bundles which will have branding right for nearly every form factor imaginable. If I’m speaking at an upcoming conference, I could download a Keynote presentation or a PowerPoint presentation and have it all branded. My Keynote matches my business cards, my business cards matches my Instagram Stories. You get the drift. I also use it to create customized proposals. Before Creative Market, I used to open up Keynote, look at a blank slide and say, "Oh My God. Where do I start?" Have you ever wasted countless hours working on a presentation only to become dissatisfied with how it looks? With Creative Market, I can click a download button and get everything I need for about ten bucks. It’s a serious no-brainer! You can even make requests for something you don’t see in a bundle. Once there was a designer whose work I really loved. She had icons for a notebook, icons for a keyboard, and a Mac icon. As a Facebook Live strategist, I really wanted something that featured live streaming so I messaged her and asked, “Can you design something that looks like a blue Yeti mic?" And she did it. Price: Templates can start at $10. But I love bundles which include tons of resources for $39. Let me jump right into what I love most about the social media management tool Agorapulse. Agorapulse collects all of a social profile’s incoming conversations and lets you take action on it. My intern loves that she can go to this one place to find everything. In the rare chance that I notice that a client’s profile doesn't have an inbox zero yet, I tap my intern and make sure that she jumps it in and responds to whatever conversations are there so that the inbox is cleared. Another thing that saves me tons of time and stress? Agorapulse reports. Click on the reporting tab. Change the date from the present day to the previous week. Click the “Export PowerPoint” button and you’re done. I usually attach the file to an email with a line or two for the client with something like, "Here are the key takeaways. This is what we're focusing on for the rest of the week." And all the KPIs that the client wants are there -- the number of tweets published, the engagement, and awareness. They don’t want to be bogged down with other stats that other social media tools try to sell. Agorapulse has a good sense of what agencies and clients want to share and it shows in their reports. Price: $49/mo + for the inbox, monitoring, publishing, and reports. Which social media marketing tools do you swear by? Enjoyed this post? Pin it.